“Then don’t” were the last words Lisa Schenke spoke to her eighteen-year-old son, Tim, as he walked out the door, saying he would not return. Tim died by suicide less than an hour later when he stood in front of a moving train. Follow Lisa through the years just after Tim’s death as she grieves and rebuilds her relationships with her family, other struggling youth, the community, God, and—most difficult of all—herself. Lisa also explores Tim’s past—his numerous accomplishments and his sincerity, as well as his depression and drug use. Lisa’s journey is made all the more challenging by an unprecedented number of teenage suicides in her small seaside community that follow Tim’s. With these deaths, Lisa becomes an accidental counselor to others who stand in the ripples of suicide. 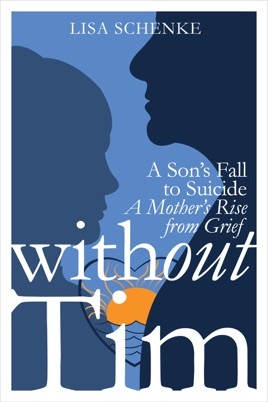 Without Tim was written with the mission to help other families, to provide encouragement and inspiration to parents and all individuals who are grieving as a result of suicide, as well as to support teens and young adults who are struggling with their own sense of self-worth.